January 22 & 23 and February 5 & 6 from Noon-5pm we'll be putting up some tables in front of our warehouse to move some "less than perfect" inventory that we're not comfortable sending out to our online customers. This means there will be some boards with funny drilling patterns or scratches, wheels with "Speed Dimples", and trucks with shipping dings for you to come and snag. There are roughly 50 decks that will be put out on the tables and an assorted amount of other shredworthies. Oh, yes, I should also mention that all products purchased in the warehouse during the sale period (non-yardsale) will be 15% Off. Light refreshments will probably be provided, so grown ups take note: Don't forget your favorite stein or flagon! For the almost grown ups in the crowd, we'll set you up with a Red Bull as long as your chaperone says it's cool! We're anticipating moving a lot of inventory, so we will be having the sale for a total of four days split between two non-consecutive weekends. Both sales are "While supplies last" so you'll need to get here right at noon to get the first grab at the goods. Thanks for reading! See you at the Yard Sale. STokED! definitely gonna be there! soooo, its free at the warehouse? Gonna try and make it for sure. I'm anxious to see some cool deals! 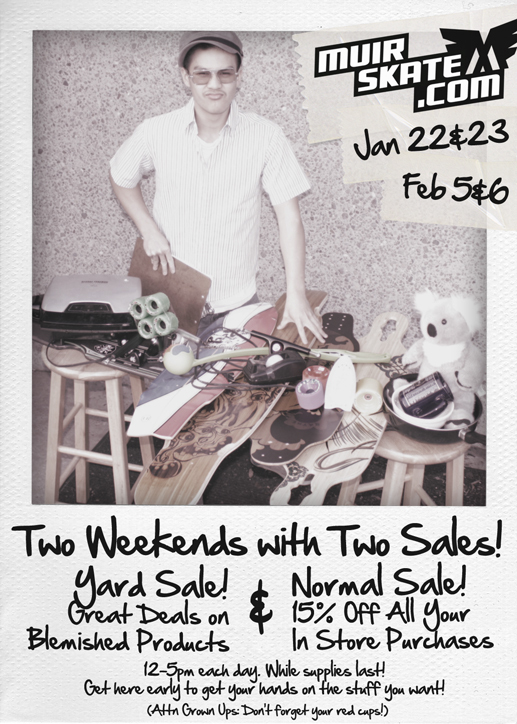 There's no charge to attend this sale!